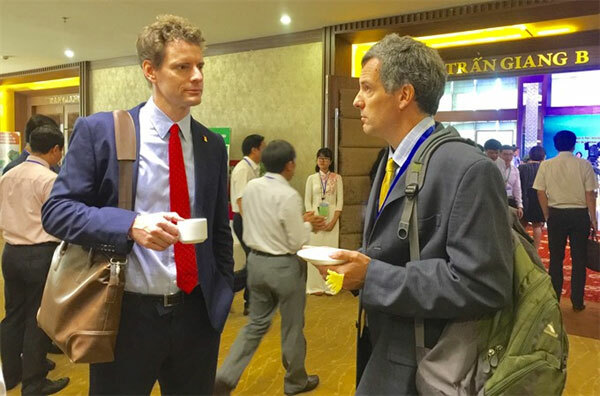 VietNamNet Bridge – More than 1,000 local and international delegates met in Can Tho today (September 26) to discuss measures to ensure sustainable and climate-resilient development of the Mekong Delta. World delegates: International delegates speak on sustainable and climate-resilient development of the Mekong Delta province in Can Tho. Deputy Prime Minister Vuong Dinh Hue told the gathering that the Mekong Delta was facing existential threats, leading to a series of negative impacts, including rising sea levels, coastal erosion and landslides. According to studies, 39 per cent of the Mekong Delta could be underwater by the year 2100. Some areas of the coast are already eroding at rates of 30 metres a year, according to Hue. Early last year, the region suffered the most severe drought in 90 years, which together with rising sea levels led to a heavy intrusion of saltwater into rice growing areas, he added. The deputy PM recommended the conference focus on fully identifying challenges caused by climate changes, especially by study the use of water source upstream from the Mekong River. He also urged the conference to estimate the main scenarios to cope with climate change. Hue also said that top-priority projects should be implemented in a timely manner to help the region cope with the issue. The two-day conference discussed challenges and solutions for water resources management in the Mekong Delta, sustainable agriculture, irrigation infrastructure, prevention of natural disaster and erosion. It also discussed integrated master planning, resources mobilisation, and co-ordination for Mekong Delta development. The two-day conference was organised by the ministries of Planning and Investment and Natural Resources and Environment.